Phil and Russ recap the UEFA Champions League Round of 16, preview the Final 8 matchups, the return of Zidane, predict what will happen this summer at PSG with Neymar and Mbappe, and discuss Juventus’ runaway season and Barcelona’s dominance. The guys also break down the tight races in the EPL and Bundesliga. Check out the other shows on the Crossing Broad Podcast Network including: Crossing Broadcast: A Philly Sports Podcast, Crossed Up: A Phillies Podcast, Snow the Goalie: A Flyers Podcast, and It’s Always Soccer in Philadelphia. 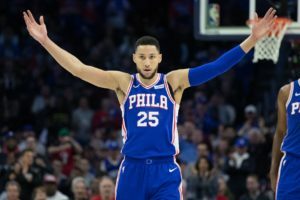 Kevin and Russ bounce around the Villanova, Temple, and St. Joe’s news, 6-for-6 fans, discuss why the Sixers season feels like a chore, the Sixers’ depth issues and the postseason, Brett Brown’s job security, Monty Williams, the timing of the Flyers’ signing of Michael Raffl, Phillies banning tweeting during player/manager availabilities, a brand-new eSports arena, and answer Twitter questions. Kevin and Russ react to the DeSean Jackson trade, Malik Jackson signing, Eagles departures, NFC East trades/signings, Jimmy Butler’s passive game as a facilitator, the Sixers’ up and down play, Bryce Harper vs. the 4 man OF, and the Flyers’ recent play. How’s this for some international/domestic news on a beautiful Saturday morning? CPFC is by no means a huge club in England, but a team in the EPL that stands somewhat safely out of relegation has value. So why should anyone in Philly care? There happens to be a local team that has repeatedly been hampered by its lack of competitive funding: Philadelphia Union. Kevin and Russ recap the weekend’s Bryce Harper updates, potential holdups, player options, the 12 excuses Philly fans can use if Harper signs elsewhere and a potential Plan B. They then discuss NBCSN Philly’s decision to cancel Philly Sports Talk, covering the Flyers/Pens Stadium Series game, the Bob Kraft scandal, Eagles coaching changes, a rant on Penguins fans, the Wayne Simmonds trade and a Philly mascot cage match. Trading C.J. Sapong was the right move for the Philadelphia Union. In the simplest terms, sporting Director Ernst Tanner took a $500k player on an expiring contract and turned him into at least $400,000 of allocation money while tacking on a performance bonus that could push the number up to $450k. Sapong is 30 years old heading into his 9th MLS season, so he’s obviously hitting the back end of his career in 2019. Something like that, depending on how you value each player. There was just no way the Union could keep six strikers for two starting spots, which would have left at least one of Santos, Picault, Burke, Accam, or Sapong out of the gameday 18 entirely. Throw in the fact that Marco Fabian and Ilsinho can also play as second strikers or withdrawn forwards in this formation if the Union want to add a wrinkle, and it looks even more clustered up top. So kudos to Tanner for getting value out of C.J. and moving the roster forward. If you followed my Union stuff or read anything I wrote from 2015-2018, you know I was not C.J. Sapong’s biggest fan. This crested in an argument with head coach Jim Curtin that spilled out into the hallway after a press conference back in 2017. My thing with C.J. is that I always felt like he underperformed relative to his talent level, a guy who I personally felt should have broken the 10-goal barrier long before his wonderful 2017 campaign. And when he did, he regressed the next season, following his 16 goals and 5 assists with just 4 and 3, respectively.